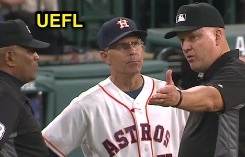 HP Umpire Ben May ejected Astros Manager AJ Hinch for arguing a strike three call in the bottom of the 8th and 1B Umpire Jeff Nelson ejected Astros CF Carlos Gomez for arguing balls and strikes prior to the 10th inning of the Mariners-Astros game. In the 8th, with none out and none on, Astros batter Carlos Correa took a 3-2 slider from Mariners pitcher Nick Vincent for a called third strike. Replays indicate the pitch was located over the outer half of home plate and below the hollow of the knee (px .31, pz 1.54 [sz_bot 1.7 / MOE 1.6]), the call was incorrect. With one out in the 9th, Astros batter Jason Castro took a 3-2 slider from Mariners pitcher Steve Cischek for a called third strike and ensuing batter George Springer took a 3-2 sinker from Cischek for a called third strike; Gomez did not bat in the 9th inning. Replays indicate the pitches to both batters were located over the inner half of home plate and belt high (Castro: px -.59, pz 2.66; Springer: px -.45, pz 2.88), the call was correct. At the time of Hinch's ejection, the Mariners were leading, 2-1. At the time of Gomez's ejection, the game was tied, 2-2. The Mariners ultimately won the contest, 3-2, in 10 innings. This is Ben May (97)'s first ejection of the 2016 MLB regular season. This is Jeff Nelson (45)'s first ejection of the 2016 MLB regular season. Ben May now has -2 points in the UEFL Standings (0 Previous + 2 [3 AAA - 1 Pen] - 4 QOCN = -2). Jeff Nelson now has 4 points in the UEFL Standings (1 Previous + 2 MLB + 1 Correct-Crewmate = 4). Crew Chief Jeff Nelson now has 3 points in Crew Division (2 Previous + 0 Incorrect + 1 Correct = 3). These are the 28th and 29th ejection reports of the 2016 MLB regular season. This is the 14th Manager ejection of 2016. This is the 15th player ejection of 2016. Prior to ejection, Gomez was 0-4 (2 SO) in the contest. This is the Astros' 1/2nd ejection of 2016, 1st in the AL West (HOU 2; TEX 1; LAA, OAK, SEA 0). This is Carlos Gomez's first ejection since July 27, 2015 (Gerry Davis; QOC = U [Replay Review]). This is AJ Hinch's first ejection since August 15, 2015 (Bill Miller; QOC = U-C [Replay Review]). This is Ben May's first ejection since S: April 2, 2015 (Tyler Flowers; QOC = Y [Out/Safe]). This is Jeff Nelson's first ejection since P: October 7, 2015 (Sean Rodriguez; QOC = U [Fighting]).